Innovation, design, a piece of art. 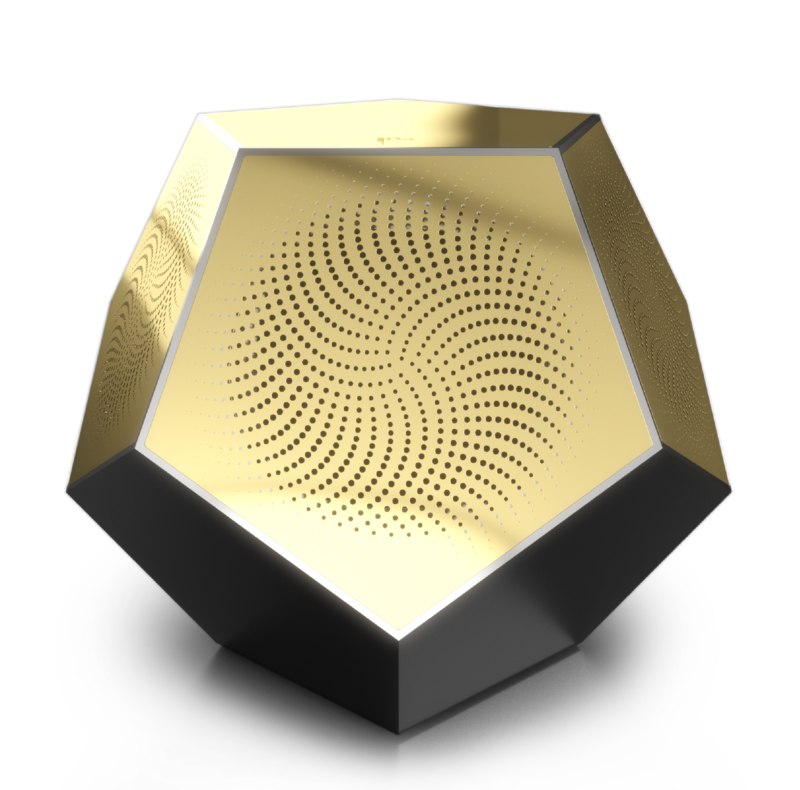 DoDecaThe first 3 channels stereo active wifi speaker in the world. First introduced in 2010, the point-source MicroDesign series has long delighted music lovers and audiophiles with outstanding sound quality and innovative design. The MicroDesign, now in its 4th iteration, performs high resolution sound with more depth and more clarity. DoDeca Wireless is a complete and fully active music system designed for how high resolution music is now to be enjoyed. It delivers exceptional sound quality, once only achievable by putting together a system of high quality separate components. DoDeca, what does it mean? Cabinet design, sound radiation, resonance, and colouration are all ereased through the seamless integration between the special design of the speakers and the acoustic features. These include the dodecaedro-designed cabinet, coaxial driver, precision-engineered. Get a three-dimensional sound image wherever you sit, for a sweet listening experience anywhere in a room using Dodeca patented design technology. 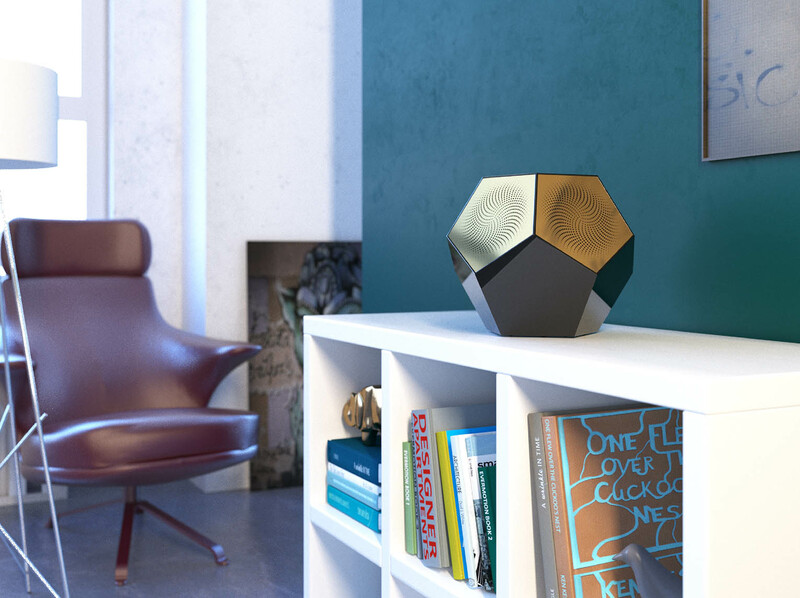 It places the tweeter in the acoustic centre of the bass/midrange cone, allowing Dodeca to create a more detailed, accurate and beautifully integrated three-dimensional sound image. DoDeca is the ﬁrst stereo 3 channel active music system in the world market. Audiophile technologies. DoDeca delivers this with a special 33° degree array of sophisticated components built in. A piece of art design. With only one speaker enclosure, Dodeca Wireless blends easily into your home with luxury of object. Available in two sharp colours, Black gloss and brass, Black satin and rust brass . The Dodecaedro design is the best shape to create more options for placement and positioning. Regardless of placement, coaxial driver technology disperses sound evenly for total listening enjoyment. Connect your devices with Wiﬁ AirPlay® and Analog input or USB. The system is thought to give people a beautiful object, an incredible sound and simple connnectivity. Trought Audiocast® app you can control fully Dodeca speaker. Easily cast music, without the hassle of pairing. Chose the device from AudioCast apps to stream the music instantly to Dodeca speaker. Search, play, pause queue songs and change the volume right from your phone – anywhere in the house. Dodeca 3 channel stereo design, 33° and Coaxial driver, no compromise. Coaxial driver is the heart of the evolved Dodeca Active Speaker. The tweeter is in the acoustic centre of the mid/bass cone, bringing the acoustic ideal of a single point source closer than ever to realisation. The result is a more detailed, accurate three-dimensional sound image, which is dispersed more evenly throughout the room than is possible with any conventional speaker. The patented design of Dodeca reduces the problem of stationary waves, and creates a new experience of listening by 3 channel conﬁguration and 33° of degree for every side. 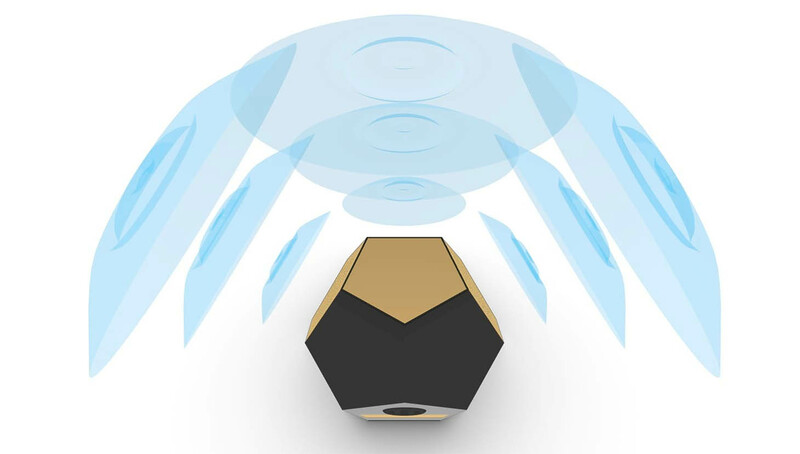 A tweeter on top of Dodeca transform the sound in an omnidirectional experience. Olographic audio image. Dodecaedro’s 33° angle allows the speaker to create an acoustic phase in order to have soundexpantion out of axis for small, medium and large room. Whether you are in the centre of the room or off to one side, recordings sound uncannily real and utterly convincing.